I just had to do a bit of shopping on my birthday, both retail and thrift. 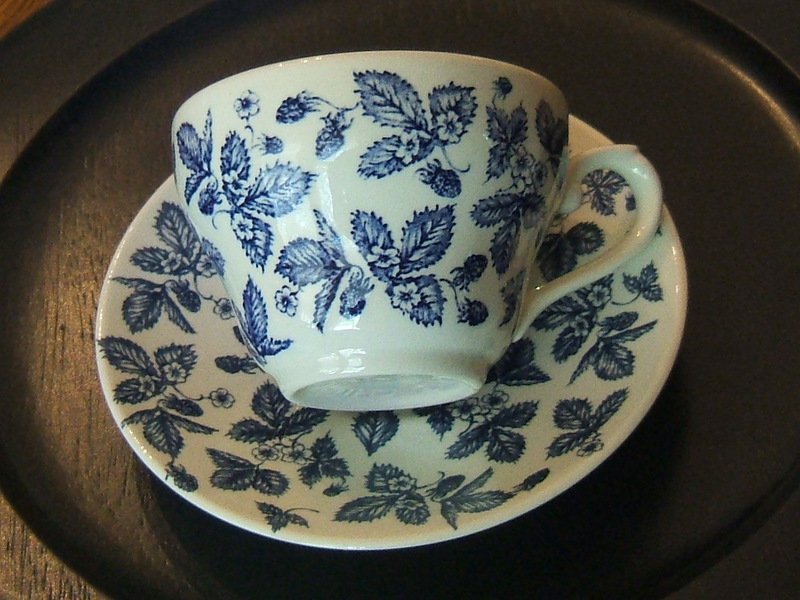 A pop into the local Salvation Army shop was not in vain as I found the three of these blue and white cups. There is no marking on them other than Churchill England. Actually, I saw the saucers first and was attracted to them but wished they had cups. The cups had been placed in another section of the room, separated from their saucer mates. I’m so happy I found them. They are now reunited. Each separate piece was marked 99¢, which is a little more than I would normally pay, but they were so pretty. Any idea what pattern this is? To me they look like blackberries. I found three small Boopie glasses marked 99¢ each to match a size I already had a few of. These round out my collection in this size. I love the suggestion Barbara F. from http://www.twobirdiesandab.blogspot.com/ made to use them turned upside down as egg holders. Since I hadn’t been to Marshall’s in a while, I thought it would be a good idea to see if there were any dishes that I just couldn’t live without. 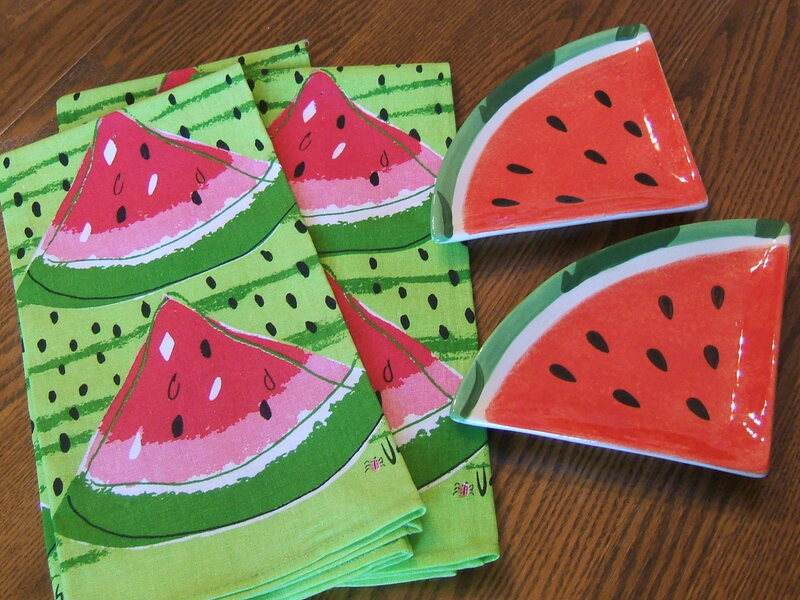 While the dish selection was slim, I did find three Vera watermelon design dishtowels. These will show up in my next tablescape so please come back to see them. I also stopped at Pier1 to pick up the watermelon slice plates with a gift card I had. Sensing a theme here? Yes, the plates are also debuting in the this week’s tablescape post. Since I had not been to my favorite neighboring town thrift in quite a while, I felt a birthday visit was in order. 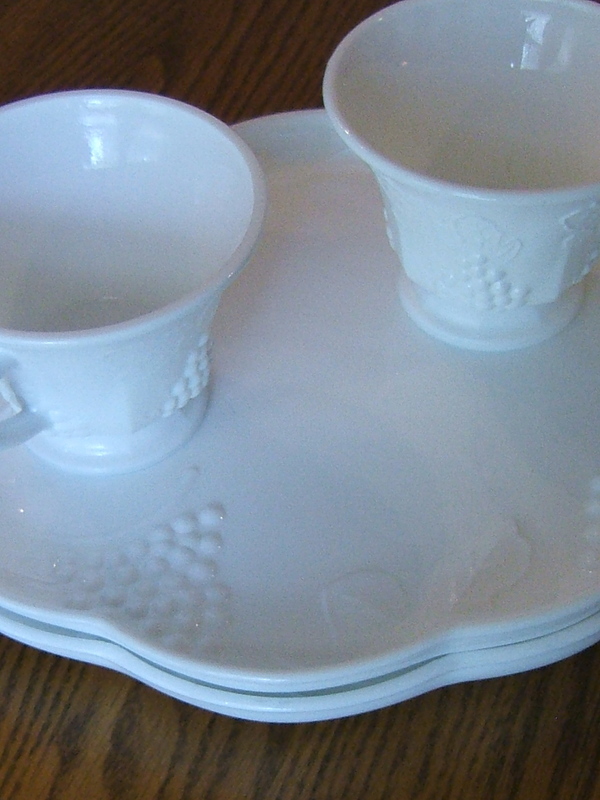 The first thing I found were two milk glass snack plates with matching cups. My friend “S” is working on a collection of these so I was delighted to find these for her. 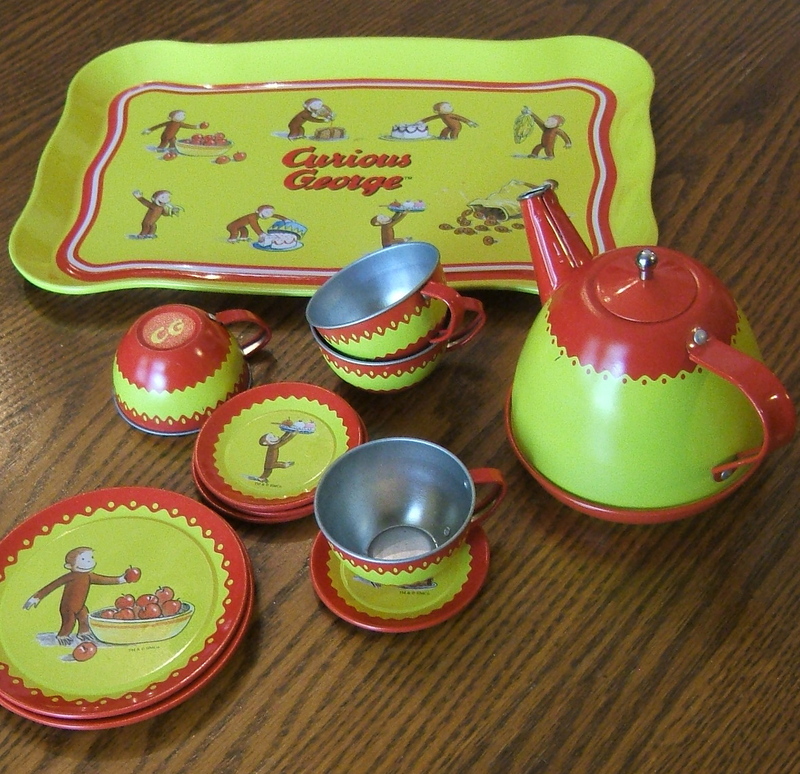 This Curious George metal tea set was too cute to leave in the store. It is not old, but it is adorable. Every plate and saucer has a different Curious George scene on it. 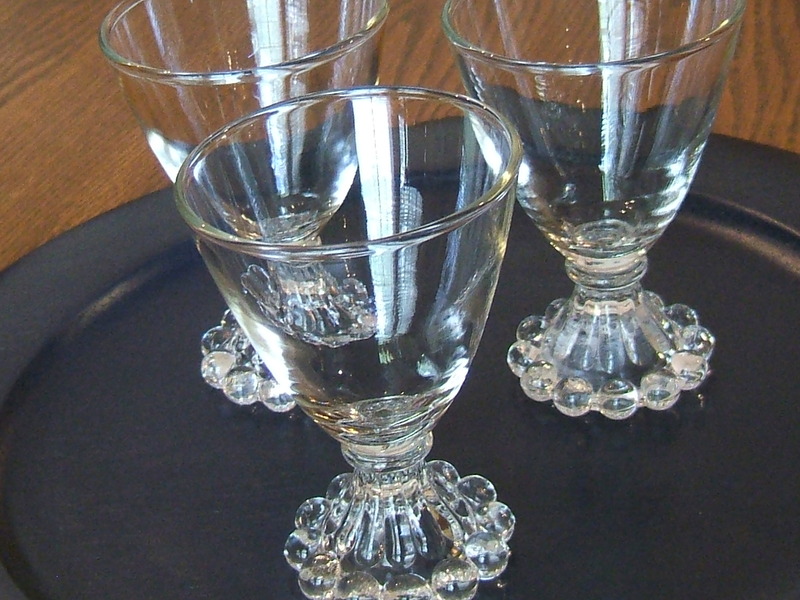 I can see a sweet tea party tablescape using these. A stop the next day at my lunch break thrift store yielded some additional finds. 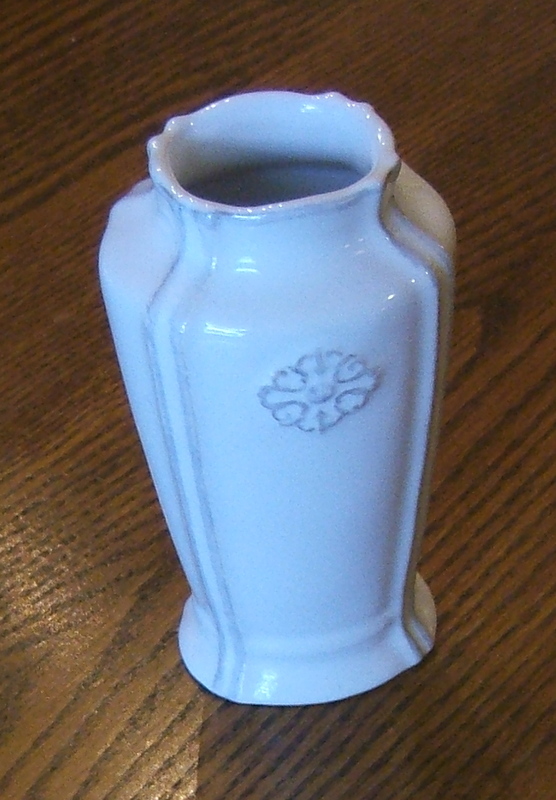 This small vase by Southern Living at Home matches one I’d found here earlier, but just a little smaller. I also found an ivy topiary. Both will be featured in a future vignette. To round out the birthday week celebration a stop at some yard sales was in order. All of these fine things were found at one sale. Sometimes you have to visit several duds before you get to the sale that sings to you. In a box of glass items, I found these three Pyrex bottles. After some research once home, I determined they are nursing bottles. I like the way they look holding these flags. 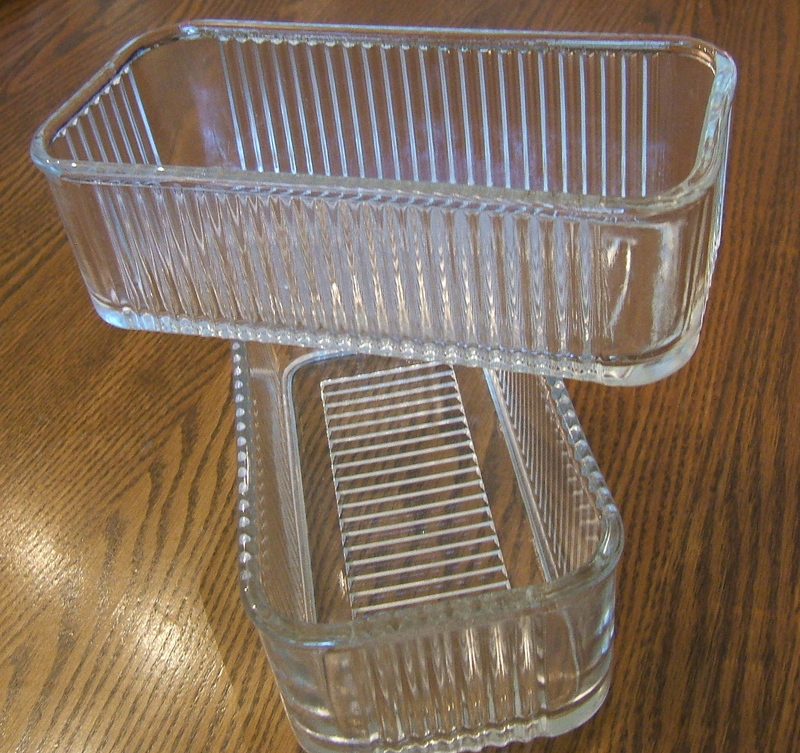 I also found the glass refrigerator containers at this sale. I know they don’t have lids, but I like them all the same. I’ll have fun deciding just what treasures they will display/store. 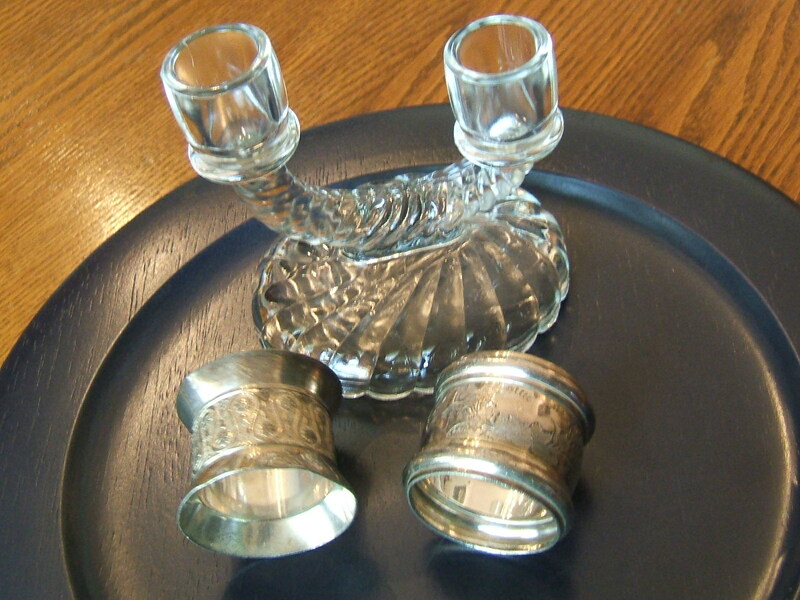 I also picked up this glass candlestick and these silver napkin rings. All of the glass items were in dire need of a bath. They cleaned up very nicely. 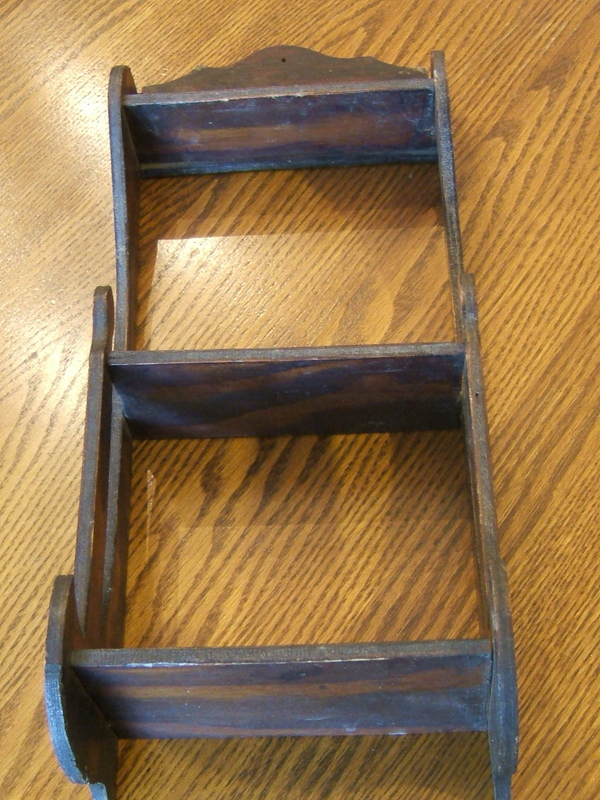 The last item I brought home from this sale was this wooden display shelf. I liked the detail on the sides and the size of this piece. I believe there is a paint job in this baby’s future. All of the items from this sale cost me a grand total of $8. 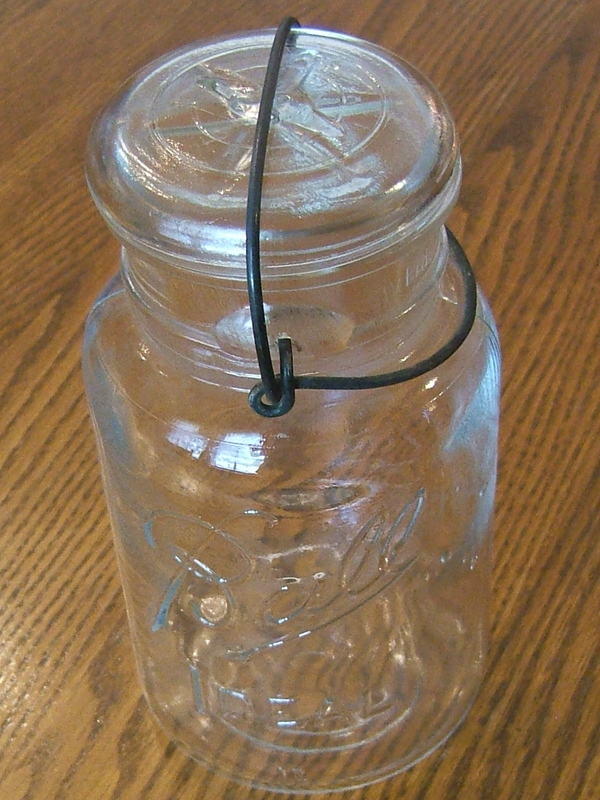 Our last stop of the day was at a sale that had lots of Ball jars. I had a momentary thought of grabbing up both boxes of jars. They were only 50¢ each so it wouldn’t have cost me too much. Nah, I decided to restrain myself and pick just one. Before I could get back to the car someone else swooped in and bought both boxes. Yes, they really were quite the deal! I hope your week was as much fun for you as my birthday week was for me. I hope to join the parties at Apron Thrift Girl’s Thrift Share Monday, Flea Market Finds at Her Library Adventures, Today’s Thrifty Treasures at Southern Hospitality, Nifty Thrifty Tuesdays at Coastal Charm, Thrifty Thursday at Tales from Bloggeritaville, and Thrifty Things Friday at The Thrifty Groove. This entry was posted in Curious George, Dishes, Garage Sales, Silver, Tablescaping, Tea Set, Thrifting, Uncategorized, Vintage, Yard Sales. Bookmark the permalink. Happy Birthday! I do love to shop thrift and retail for my birthday also. You found some wonderful items this week. I love Boopie glasses and have several sizes including the one you found. Looking forward to the Watermelon tablescape for sure! Tammy, you found some great things! 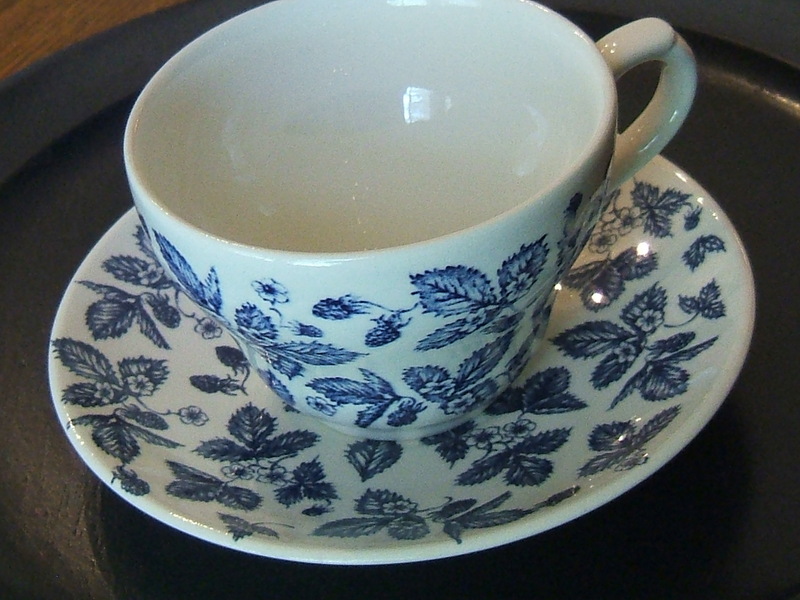 I love the tea cups, they look like berries to me too. Thanks for the mention about the boopie glasses. I use them mostly to display handpainted eggs I bought at a craft fair years ago. Were you ever on Blogger? I am so fed up with it I want to switch. How is WordPress? Happy birthday to you! You were on a huge roll! What fabulous treasures you found; I think I like the little Curious George tea set the best. Holy Cow!!! You found some AWESOME LOOT!!!! Great finds! You could use your ref. 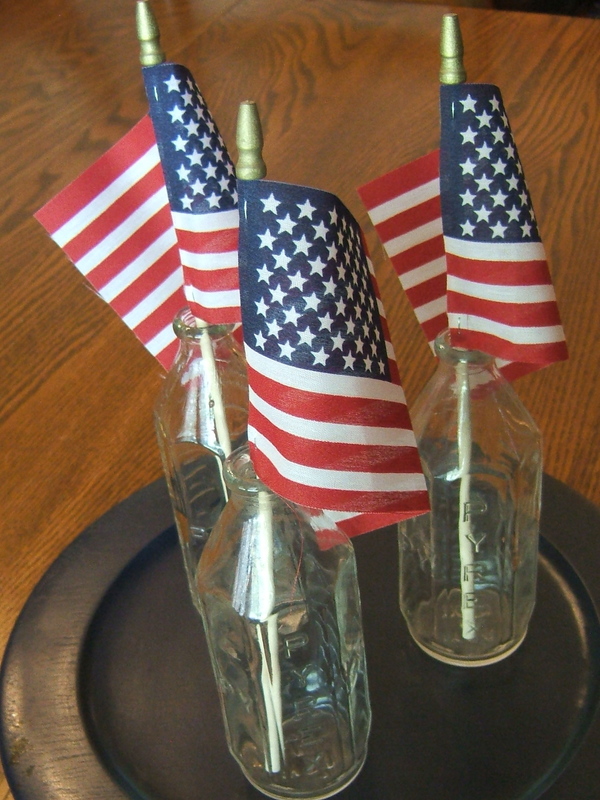 glass containers as bases for flower arrangements. Found you through Southern Hospitality. There would be no way to pass up that Curious George set. Just love it. The Curious George set is awesome! I loved him as a kid. Happy Birthday…..did you hear me groan? I think that Curious George set is so cute. I can’t wait to see how you display them. Happy Belated Birthday! You’ve gotten some great stuff. I love the blue dishes and I’m glad you found the saucers. I love to go thrifting too! You never know what kind of treasures you can find.Have a great week! Great finds! I have the same milk glass luncheon set. I hope to do a tablescape with them soon. And happy belated birthday! You celebrated the same way i would have….thrifting! LOL And thank you in advance for joining TTF. I hope you week is wonderful! Wonderful finds Tammy. I love those Boopie glasses. I have a couple and like to have iced tea in them. What great goodies you found. I esp like the Curious George tea set as my granddaughter and I love to have tea parties.